We are talking to neighbouring communities and the Councils about two new Hoppa Bus routes to link Highgate to local shopping centres, hospitals and schools. Tell us what you think about the proposed routes and get in touch if you would like to help with the campaign. obviously any new bus route is a good thing. As a resident of Cholmely park, I would not have a problem with a small bus on the road. I am not keen on bus stops on the street – our street is cluttered enough with parking restriction and speed limit signs. I would also like reassurance that we would not lose parking bays. I am assuming that this would be a ‘hail’ bus. The biggest issue is the traffic congestion in the morning and afternoon at the Highgate Hill end, caused by Channing parents dropping and collecting. The parking is often very selfish, blocking Cholmely park. A bus would only add to this, making it even harder for residents to enter and leave their street. Any new bus route would need to address the issue of dovetailing with the Channing school run so as not to inconvenience residents even more. All of this said, I am in favour of increased public transport. It would be lovely to bus to Crouch End if necessary – I usually walk but the bus back would make shopping there much easier. Any new Hoppa routes should use electric vehicles, to reduce air and noise pollution. All these roads already suffer from heavy vehicle traffic. Cholmeley Park is already burdened with traffic jams at different times of the day, especially due to Channing School. In addition, the construction works perpetually underway on the Channing grounds results in a lot of heavy vehicular traffic which causes additional problems. The case for a new bus Hoppa route is very weak, considering that we have access to many buses on Highgate Hill as well as Archway Road. Furthermore, Highgate and Archway tune stations are also within easy reach. A Hoppa bus would not likely attract many passengers and only add to the congestion we often experience on Cholmeley Park. 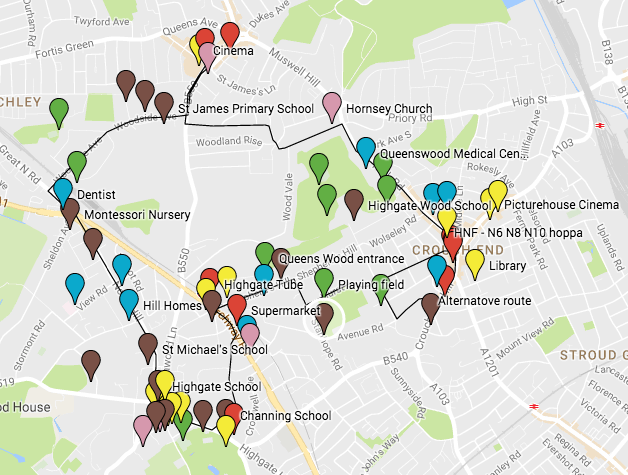 Crouch End Neighbourhood Forum would be very interested in helping with the campaign for the Crouch End/Highgate/Muswell Hill/Highgate Crouch End route. It is exciting for us as it serves two parts of Crouch End that are not directly served by Public Transport at the moment – Crouch Hall Rd/Hurst Ave, and Cranley Gdns, and provides for the first time a direct link between the town centre and Highgate Underground station. Cholmeley Park is totally unsuited as a bus route. Overall the street is quite narrow with parking both sides. In places due to he hilly nature of the street and bends in the road visibility is restricted. The roundabout at the junction with Causton Road and Cholmeley Cresent adds to the difficulties. The entrance to Cholmeley Park from the Archway Road is narrow, with speed humps, and is unsuitable for regular heavy vehicles. Vehicles turning right into Cholmeley Park from the Archway Road cause inconvenience and danger if a large vehicle stops to allow a car to turn in to Cholmely Park as visibility of approaching traffic in the bus lane is obscured. This is especially a problem if a motor cycle is zooming up the bus lane. Similarly the entrance from Highgate High Street is narrow and congested, especially when parents are dropping-off and picking-up pupils from Channing School. A bus route would put the girls at even greater risk from traffic. Traffic already often has difficulty in passing on Cholmeley Park necessitating, at times, difficult reversing on the hilly and bendy sections. Parking spaces on Cholmeley Park are already limited and may be reduced to accommodate new bus stops (more street furniture?). These limited parking spaces are already at risk from the new development at the ‘Richardson’s’ site on Causton Road. If winter conditions are icy or snowy Cholmeley Park becomes dangerous and at times impassable. In my opinion Tfl would be hard pressed to find a road less suited to a bus route than Cholmeley Park. I can’t see the need for a Hoppa Bus when the area is so well serviced with bus routes. There are already bus stops at the top of Cholmely on the High Street, and near the bottom, on the Archway Road. The constant lorry traffic we have suffered for the last few years has demonstrated the adverse effect of larger vehicles on local car traffic flow. The road is too narrow for a bus stop, and as has already been pointed out, parking is limited enough already for those living on the road. We would applaud far more a motion for a proper restriction on Channing parents who continue to park at the top of the road to drop children off or pick them up despite the best efforts of the headmistress and local traffic policing. The chaos that this causes first thing is a clear demonstration of the effect a bus would have. Cholmeley Park doesn’t seem to be a popular route for the eastern Hoppa; as a Crouch End ‘foreigner’ I’m not familiar with this street and the problems caused by Channing School’s school run. I wonder if Cromwell Avenue, which runs on a parallel route but just to the South would be an acceptable alternative. I don’t think the issue is really about the many bus routes which already follow the main roads in Highgate but about providing a bus service to areas which currently don’t have one – Crouch Hall Rd, Cranley Gdns, Woodside Ave. It’s also about linking Crouch End directly with Highgate tube and village for the first time – thereby also giving Highgate access to the best shopping centre in the area ! Other thoughts; there might be economies of scale in linking the two routes at their point of touch on Highgate Hill, thereby opening up a wide range of destinations to Muswell Hillers, Crouch Enders, and Highgate folk; also there might be an advantage in extending the West route from Woodside Ave to call in at East Finchley tube. I fully agree with the other respondents who have explained that Cholmeley Park is the wrong route for the various reasons given already. Why not ask the pupils/parents of Channing School to see if they can use the new Hoppa , perhaps the route could be refined to miss speed humps, congestion at school drop offs, but it would be wonderful to reduce the cars to Channing School. The idea of hoppa buses – which has been hugely endorsed by residents in all the Forum’s consultations – is that they reduce car use. 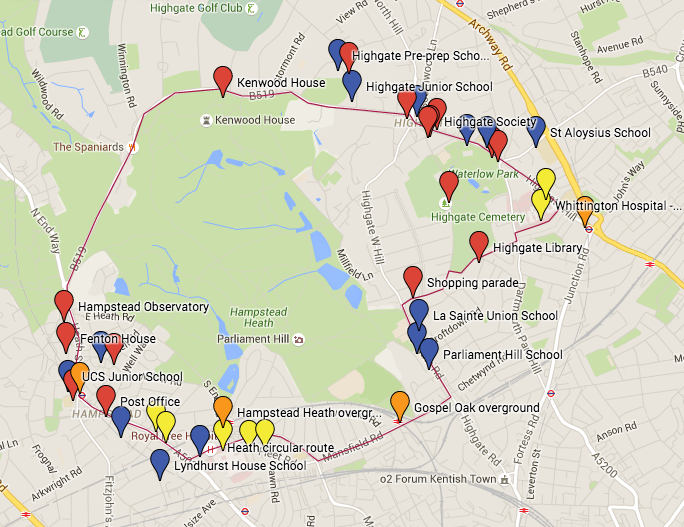 Hoppa buses linking Crouch End, Muswell Hill and Highgate, and Highgate to Hampstead, should take lots of school traffic off our roads. The buses are quiet, and hail and ride means there is no loss of parking for bus stops. Highgate residents can get to the fantastic cinemas and shops in Crouch End and Muswell Hill without taking a car and having to park, and MH and CE residents can get to our lovely pubs and parks. While Highgate is well served by arterial routes on Highgate Hill and Archway Road, the lateral services are very poor. These two proposed routes are trying to address that. Buses come in lots of sizes. The W5 travels along streets in Crouch End which are narrower and just as steep as Cholmeley Park but it may be that even smaller buses would be more suitable for these routes or modifications of them. We have put these ideas forward and invited comment to get the ball rolling and see what people think. These two proposed routes are simply starting points for discussion. The next step is to meet the Crouch End Neighbourhood Forum to see if we can work together. We’re trying to get a win win – less traffic means less pollution, and easier access to all local centres is good for business. Are the proposed routes to be run clockwise, anticlockwise, or in both directions? Both directions but – to stress again – these are just routes for discussion, as yet. I have a slight concern that this may expose Cholmeley Park to more bus routes. In addition, a bus, however small it can be, may make a lot of noise each time it slows down and speeds up before and after a hump. Perhaps, the benefits of having yet another bus need further clarification. Any addition to the existing number of vehicles would increase traffic and air (and noise) pollution, which is already quite noticeable. We’ve been looking to move from the west side of Highgate over to the Highgate/Crouch End border. The only thing stopping us is the lack of lateral transport. We depend on bus and tube since we gave up our car some years ago, so please let’s make these new hoppa routes happen.